Lots of people I know are all about cutting welfare, and cheer about the idea of “personal responsibility.” While, to a certain degree, I agree with the idea, I also acknowledge the reality. Sometimes we need help getting on our feet. The truth is that many of the people that we judge on welfare — freaking out about cell phones and clothes and candy bars — do, in fact work hard (or wish they could work more). 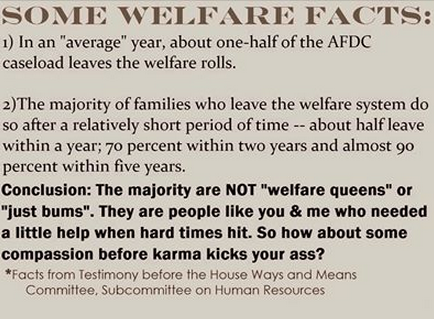 The takeaway is that a little less than 20 percent of AFDC recipients actually remain on welfare long-term. 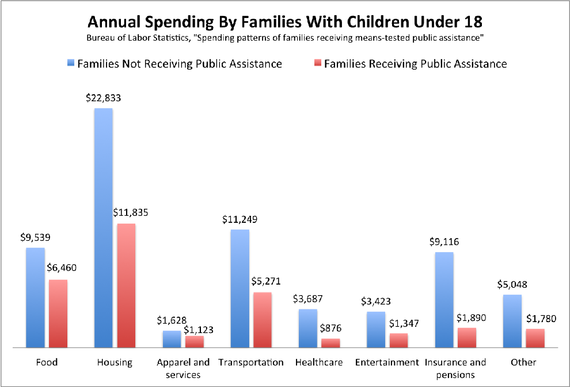 A larger percentage, 53.5 percent, are off welfare within two years. This doesn’t really match with the image many like to self-righteously associate with the myth of “welfare queen” living on high the hog. 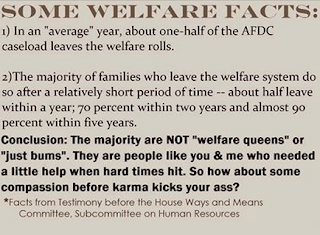 However, the image of the “welfare queen,” based largely on a one-woman rampage back in the 1970s, persists as the definitive view of someone receiving government assistance. Add in the idea that “most” of the people on welfare are getting free cell phones and abusing food stamps, and you have many people who look down on a group of people who are — by and large — just trying to get by in difficult circumstances. Forget that many of those on welfare are the elderly, are veterans (don’t even get me started on “patriotic” Americans who have no problem cutting programs that benefit veterans), and are children. Children. Plus, believing that most welfare recipients are lazy and underserving, with a select few on the rolls who truly “deserve” the help (despite evidence indicating that the reality is the opposite case), makes it so much easier for middle class Americans to feel good about judging others’ choices. So many of us are so caught up on whether or not a welfare recipients should have a bigger TVs than their more “deserving,” less poor counterparts that they aren’t even paying attention to welfare recipients that claim more of their tax dollars. Among the most outrageous expenditures is corporate welfare. Desperate businesses now overrun Washington, begging for alms. Believing that profits should be theirs while losses should be everyone else’s, corporations have convinced policymakers to underwrite virtually every industry: agriculture, education, energy, housing, manufacturing, medicine, transportation, and much more. One of the reasons that corporate subsidies would make a good start? How about the consideration that more of our tax dollars are spent on corporate welfare than on poor people. Please explain why you’re so bent out of shape when someone on welfare buys new shoes, but it doesn’t bother you that Exxon Mobil is receiving tax breaks and outright subsidies in spite of huge profits? Are you so concerned that your welfare-recipient neighbor might be cheating the system that you scrutinize every $50 purchase s/he makes, but you aren’t worried about what huge (and profitable) factory farmers like ADM, Monsanto, and ConAgra are doing with your tax dollars? It’s a mindset that baffles me. More taxpayer money goes toward subsidizing profitable corporations than goes toward food stamps. I know that people cheat the system. I know that people spend money on things they *shouldn’t* buy. (Although, really, who doesn’t have an indiscreet purchase in the past?) However, I’d still rather see money going to actual people who probably need it than to profitable corporations that definitely don’t. Not everyone on welfare is morally bankrupt, lazy, and undeserving of help. And last I checked, it wasn’t up to us to decide who was “deserving,” anyway. Welfare recipients aren’t bankrupting this country. My priorities are more about helping people who need help, and I’m not going to freak out at the idea that a small portion of them might be abusing the system. Just to help you feel better, here’s an indication that you are still probably spending more in most categories that someone who’s receiving government help. See? You probably do live better than someone on welfare. Aren’t you glad you deserve your relative wealth?